A Maryland staple, these crab cakes made from fresh lump crab meat and Old Bay are authentic and easy to prepare. When you live in Maryland, eating Chesapeake blue crabs is practically a religion—and, in my family, we are all loyal devotees. Every summer, we hit all of our favorite crab shacks, from local joints all the way to dives on the Eastern shore, where you can look out over the Bay and put your feet in the sand. I’d never attempt making steamed blue crabs at home (live crabs, giant steamers—yikes!) but I do often make crab cakes, which are just as delicious and so much easier to prepare, not to mention eat. The key is to use fresh lump crabmeat and to go light on the filler. These have just enough filler to bind the crabmeat together and also add great flavor. I love them with the quick tartar sauce below, but you could also serve them with lemon wedges or cocktail sauce. The most important thing when you’re making crab cakes is to use fresh, good quality lump crab meat. I get mine at Whole Foods, which can be expensive, but one pound is enough to make six generous crab cakes (or 12 mini ones), which feeds my family of four easily. Celery is not traditional in Maryland crab cakes, but I love the little crunch it adds; feel free to leave it out if you’re a purist. To begin, combine the eggs, mayonnaise, Dijon mustard, Worcestershire, Old Bay, salt, celery, and parsley in a bowl. Add the crab meat (be sure to check the meat for any hard and sharp cartilage) and panko; gently fold mixture together until just combined, being careful not to shred the crab meat. Shape into 6 crab cakes (about ½ cup each) and place on prepared baking sheet. Cover and refrigerate for at least 1 hour. This is really important to help the crab cakes set. Preheat a large nonstick pan to medium heat and coat with canola oil. When oil is hot, place crab cakes in pan and cook until golden brown, about 3 to 5 minutes. Flip and cook 3 to 5 minutes more, or until golden. Be careful as the oil may splatter. Combine the mayonnaise, Dijon mustard, sweet pickle relish, red onion, lemon, salt, and pepper in a small bowl. Whisk well, then cover and chill until ready to serve with the crab cakes. Line a baking sheet with aluminum foil for easy clean-up. Combine the eggs, mayonnaise, Dijon mustard, Worcestershire, Old Bay, salt, celery, and parsley in a large bowl and mix well. Add the crab meat (be sure to check the meat for any hard and sharp cartilage) and panko; using a rubber spatula, gently fold the mixture together until just combined, being careful not to shred the crab meat. 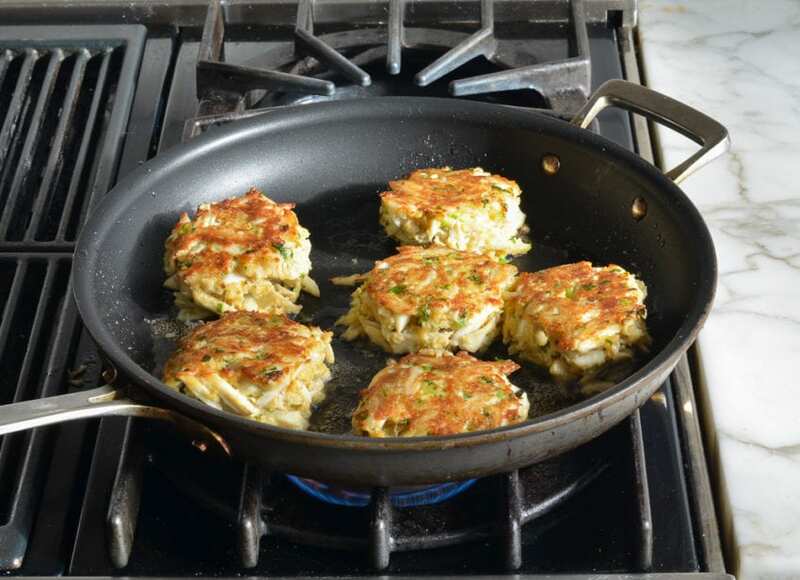 Shape into 6 crab cakes (each about ½ cup) and place on the prepared baking sheet. Cover and refrigerate for at least 1 hour. This helps them set. Preheat a large nonstick pan to medium heat and coat with canola oil. When the oil is hot, place the crab cakes in the pan and cook until golden brown, 3 to 5 minutes per side. Be careful as oil may splatter. Serve immediately with tartar sauce or a squeeze of lemon. Note: If you can only find jumbo lump crab meat, you may need to break the pieces up a bit. If the clumps are too large, the crab cakes won't hold together well. Note: The nutritional information is for the crab cakes only. This recipe has become our gold standard for crab cakes. This is also true of several of Jenn’s recipes! I made this as a last resort since I did not have my usual recipe with me. Now it is my go to recipe. Made as is, I found this to be easy and straightforward. Delicious. And don’t forget the sauce! Hi Taryn, I’d suggest you use a combination of baking and broiling; bake them in a 350-degree oven on a lightly greased baking sheet for about twenty minutes, or until hot (and it’s not necessary to flip them). Then I’d slide them under the broiler for about a minute to get them golden brown on top. Enjoy! I have not tried this recipe but can see that it would be yummy! I lived 60 years in Maryland and frankly never had a great cake with celery, pickle relish, Worchestershire or mustard…..parsley, yes. My dad had a restaurant (as did his father) and his recipe was similar except that he used crushed Saltine crackers to help hold the cakes together. I agree that good quality fresh crab meat is essential ( like backfin). The less filler the better. Add mayo, Old Bay Seasoning, egg, parsley, cracker crumbs, salt and pepper. Different areas of Maryland have their own recipes. Pick and choose fillers that your family will enjoy. Could you recommend an alternative to the celery? My husband has an allergy to celery. Hi Susan, you can just omit the celery, but if you’d like to replace it with something, jicama is a good alternative. Hope you enjoy! As an alternate to celery she could use sweet peppers. I used both and it was awesome. I made these tonight and I loved them! !….I used Italian bread crumbs instead of the other and put them in a little flour just before frying them…OMG…delicious! I followed your recipe word for word last night and made 8 crab cakes with Jumbo Lump and Lump crab meat. Valentine’s Day Dinner for the family was a huge hit. I will definitely use your recipe for crab cakes moving forward. Thank you! A neighbor has an annual meal for 6-8 of us, and we all bring appetizers. I opted to bring this dish, using lump crab in a plastic container — from the refrigerator section of our store. Having had fresh crab many times, I can’t say the crab I used was perfect, but the results were still outstanding. There were no crab cakes left, and the tartar sauce recipe is one I use for other dishes now too. These crab cakes are the best! I’m making them again for my hubby for Valentine’s Day this week along with Jenn’s divine chocolate cream pie. Perfect and easy celebratory dinner. It sounds like you are just looking at the portion of the page that has the pictures with some instructions underneath. If you scroll down a bit to under the pictures, you’ll find the full recipe. Alternatively, at the very top of the page, to the right of the recipe name, you’ll see an icon that looks like a notepad – if you click on that, it will take you directly to the recipe. Hope that clarifies! Great recipe, the crab cakes turned out great. My daughter really loved them. Can these sit in the fridge longer than an hour? Say make them the night before or the morning of, and leave them in the fridge for a night and/or day? Thanks! My husband has a heart condition and has to watch his sodium intake. Is there anyway to reduce the sodium in this recipe besides the salt? Hi Jean, You could reduce the Old Bay, as it has a lot of sodium. Hope that helps! Can you use king crab leg meat instead of lump crab in this recipe? Thanks, love your website, and happy new year! Sure, Liz – I think that will work. Enjoy! In the past, I could never get my crab cakes to stay together so I stopped making them. I think the key to these cakes is to refridgerate. Thank u for this recipe, and now I will be making lots of crab cakes. I’m making these for the second time today. My first effort last month was such a hit with my crab cake aficiondao son, I had to make them again. Thanks Jenn! I’m sure I’ve left a review on one of the many recipes I’ve tried from you, Jen, but after going through many of my printed recipes I came across this one and decided to make it for lunch today! I only had canned chunk crab, so I opened two of them and halved the recipe. I got three nice sized cakes – perfect for the two of us. I also didn’t have parsley (crazy that I didn’t dry some of the fresh parsley I grew all summer), so I substituted some green onion. I did put them in the fridge for an hour and they held up perfectly. I was so glad to see a recipe that didn’t call for green/red peppers in it. They’re like the kind we had on the west coast – very nice, and perfect with the homemade tartar sauce I also made from this recipe. Do you think I can use this recipe to stuff mushrooms and if so could the stuffing me done a day ahead? Would like to make for Christmas appetizers in small brown mushrooms. Yes, Dolores, I think the crab mixture would work nicely here and that you could get away with assembling them in advance. I’d love to hear how they turn out! This is similar to the recipe I use to stuff mushrooms. I make these quite often and they are just as tasty tonight as they were the first time that I made them. My wife and I love them and tonight my grandson was inducted into the fan club. Thanks for the terrific recipe Jennifer! The only thing that I have changed, is that I cook them in the air fryer. I cook them at 400 degrees for 5 minutes a side. They come out perfect. By the way, love the book! We live in Northern California near the coast. My avid fisherman son went out and got 20 Dungeness crabs, all about 3 lbs each!! This seems to be quite an extraordinary season. We made a huge dent in it for Thanksgiving (much better than turkey), but we still had lots leftover. I made your wonderful crabcakes tonight. They turned out beautifully, tasted sublime. Dungeness must be quite different than Blue Crab, but never having had Blue, I didn’t know what to expect. I had to add more crab and found the mixture was still quite wet. It was fine once the Panko was added, but I think if I only had 1 lb of Dungeness to work with, I would probably have to cut back on the liquids. Just a little tweaking was all it took. The final dish was well balanced, seasoned perfectly and enhanced rather than hid the flavor of our sweet west coast crab. At any rate the recipe is a definite keeper as are all that I’ve tried. Thank you Jenn. I love everything about this site. I Made these (Only omitting the Celery, sorry) and they are soooo good!!!! I wish I knew how to add my pictures. I’m in heaven and these will definitely be on every Holiday dinner menu going forward, starting with Thanksgiving! Ty So Much Jenn! Pure excellence! Unbelievably tasty! Made as written! Shrimp Cakes: I used your recipe with raw shrimp that were shelled and deveined. Cut them into small pieces then used them instead of crab..also, because the shrimp seemed somewhat “wet”, I added maybe 1/4 cup more than recipe called for. Held up well in the skillet. And from a guy who lives in Kansas City, these were a treat..Thanks Jenn. I love your idea of shrimp cakes for something different because I always have shrimp in the freezer, but I don’t always have crab! I’ve been craving crab cakes ever since returning from my vacation at the Maryland shore. This recipe was just perfect! I left out the salt, though. The salt in the Old Bay was enough for me. I had no idea they were so easy to make. Thank you! I made these crab cakes for my Sister-in-law last Christmas (it was requested). I followed the recipe except for the Dijon mustard, which I don’t like, so I don’t keep it on hand. They turned out GREAT! They held together very well, the refrigeration step helps with that. They tasted excellent! I got rave reviews, thanks for such an easy recipe. The best crab cake recipe I’ve made! It’s now my go to recipe. Utterly delicious and just about perfect! However there’s a slight variation I’ll offer here for anyone who might be interested, that more closely follows the famously magnificent local house made tradition for crab cakes down here on Maryland’s Lower Eastern Shore. Our Somerset County is the home of Crisfield the “Crab Capital of the World.” Anyway…Just substitute original flavor Ritz crackers finely ground to dust, ideally using a mortar and pestle, for the yummy and trendy Panko breading (which is also excellent). The particles of Ritz dust are too small for any identifiable texture of filler, so they do nothing but hold the cake together, almost as if using self-rising flour. Also, if one has eaten a lifetime of local crab cakes here on the Shore, the subtle Ritz flavor imparts that last little bit of “Downey Ocean, hon” authenticity. I need to note that Ritz is not “better” than Panko but rather merely different, with each wonderful in their own way. It might even be that with enough experimentation the difference comes down to how well each variety goes with whatever else will fill the plates for a particular meal. I’ll be using this Panko recipe again and again because it’s the ONLY one I’ve found online that comes up to the default or baseline recipe I’ve used for years, from an ancient cookbook by the legendary Mrs. Kitching of Smith Island on Tangier Sound. Thank you Jenn Segal! I am making these to enjoy for dinner and to freeze for another time, how would you suggest heating these from a frozen state? Hi Kristen, I haven’t frozen these, so I can’t say for sure, but I’d suggest reheating them in a 350°F oven for about 15 min. Enjoy! These were STILL amazing! I can’t imagine how good they must taste with all the right ingredients. I will be making these as an appetizer. If my dinner guests arrive at 7pm, how early can I pan fry these? Hi Zed, I’d say 30 minutes before and keep warm in a low oven. Hope everyone enjoys! I follow your recipe except for not adding the celery, but my crab cakes turns out really salty. Do you know why and how to fix it? I still have 6 uncooked crab cakes. Thank you for your help. Hi Kelly, Sorry to hear these are too salty for you! I think the best way for you to salvage them is to recombine the remaining crab cakes in a bowl and add more of all the other ingredients with the exception of the salt and Old Bay seasoning. Hope that helps! Hi Jenn. I did like what you told me and it came out pretty good. Thank you so much for your help. I was o happy to see you replied. These are absolutely wonderful! We cannot wait to make them again! I’ve made these multiple time to rave reviews. We have company coming tomorrow and I’m making them again. Is there a side dish that you recommend other than corn? Thank you. And, great interview on Powell’s Books! Thank you, Renee! I think these go really well with any simple green vegetable, like these green beans or the butter braised Brussels sprouts in my cookbook — and definitely cornbread. These delicious crab cakes have thrilled guests on many occasions. All raves all the time. Guests are coming this weekend and I’m wondering if you recommend any specific side dishes to go with these? I serve them without a roll. Your corn muffins sound tempting but are they too sweet for this? Anything else? They may bring a tossed salad so that’s out. The roasted carrots in your book sound delicious too. Hi Renee, so glad you like these crab cakes! The corn muffins would go nicely here and I don’t think they’re too sweet to be a natural pairing. The carrots would also be nice as would the French Green Beans with Shallots. Also, I have a feature on the website– for all main dishes, I suggest one or two sides that I think would pair nicely with them. To see what I’ve suggested, scroll to the top of the recipe page and, immediately under the recipe title, you’ll see a bar with several options, one of which says “pair with.” If you click on this, you’ll see the sides I’ve suggested. If I cook them in the oven how long it will take and what temperature? Hi Nancy, I’d suggest you use a combination of baking and broiling; bake them in a 350-degree oven on a lightly greased baking sheet for about twenty minutes, or until hot (and it’s not necessary to flip them). Then I’d slide them under the broiler for about a minute to get them golden brown on top. Enjoy! OK. That does it. Best crab cakes since my trip to Maryland in 1976 (so many tries to get the perfect taste, alas). Now I HAVE to buy your book. 5 stars for EVERYTHING I tried that you posted. And I am picky. Not to mention obsessed with cooking. Thank you Jenn!!! I purchased fresh lump crabmeat and used your recipe. Fabulous, tastes like my Moms did years ago! Followed your recipe without any deviation and it was a huge hit! Thank you for sharing!!! Hi Michele, I’d use this recipe instead for salmon. All of your recipes and cooking tips are so wonderful. Thanks for all of the info and the time you use to prepare such lovely food. I’ll review this every time you post it Jen. It’s my absolute go to recipe for any kind of “seafood” cake. I don’t use Old Bay… that’s the only difference. Well, depending on the palates these will be served to, I might add some finely chopped onions. Otherwise, this recipe works great as is for crab, flounder, cod, pollock, and salmon. Another outstanding recipe, Jennifer. Great job! Just wanted to say that I’ve been making this recipe for about a year now. With the exception of one modification, I follow your instructions to the last detail (which is unusual for me), and I get the best crab cakes ever. I make them for special occasions and for dinner guests. I’ve had compliments like “these are better than in any restaurant” and “these are the best I’ve ever tasted.” It’s a perfect recipe. (My one modification is to use 1/2 mayo and 1/2 greek yogurt. I do this only bc I don’t like mayo. I also do a different sauce for the same reason.) Thanks for another great recipe! Hi! Can plain Greek yogurt be substituted for the mayo? Maybe you have already answered this already…. We love all or your recipes!! Hi Debra, I love the flavor of mayo here but Greek yogurt will work – just cut back a bit on the lemon juice since the yogurt will add acidity. I have loved this recipe since I first found it a few years ago! The BEST in my opinion. Full of flavor without over powering the crab. Every morsel is deliciously decadent. Every bite as tasty as the first…. 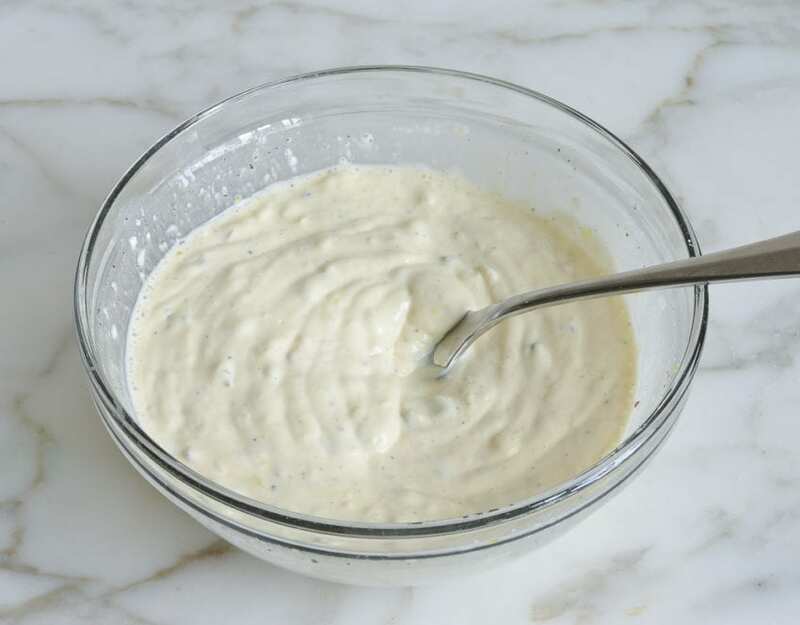 The tarter sauce is easy and equally as tasty… Thank you so much for sharing this fantastically easy and tasty recipe. One of my absolute FAVORITES! This recipe is amazing! So simple and delicious. It’s become a staple of my family’s summer meals. I tried the Maryland Crab Cake recipe and was quite happy with it. I used freshly caught and cooked crabmeat and added some finely diced red and yellow peppers for a bit of color. Delicious! I made these today and will be sharing them with a friend, neighbor and mother in law. They were delicious! I tried making the tartar sauce and it was pretty thin and didn’ have the kick I was expecting. Would love others feedback or suggestions. I have a ton of leftover king crab legs… what are your thoughts on using this fab for this recipe? I think that should work, Melanie. Hope you enjoy! These are absolutely delicious! Extremely easy. Has anyone tried baking them somehow rather than frying? Glad you like them, Sharon! If you’d prefer to cook these in the oven, I’d suggest you use a combination of baking and broiling; bake them in a 350-degree oven on a lightly greased baking sheet for about twenty minutes, or until hot (and it’s not necessary to flip them). Then I’d slide them under the broiler for about a minute to get them golden brown on top. Enjoy! Loved this recipe! I had 1/4 pound of leftover crab from a restaurant and adjusted the recipe. Thanks! Hi Florence, If you click on the “recipe” tab at the top, you’ll find all of the quantities needed. It looks like you also have red onion in the crab meat mixture in the picture. Yes? No? Hi Susan, There’s no red onion in the crab meat mixture – just in the tartar sauce. Enjoy! I actually used this recipe the first time I ever made crab cakes and they turned out perfect! So delicious pair right along with the quick tartar sauce. Thank you for sharing your kitchen inspiration. I’ve tried many recipes and this one is by far the easiest and most tasteful. The crab cakes were not dry as others have been and got rave reviews including being asked for the recipe! Def a keeper!!! These are amazing and so easy to put together!! I chilled the cakes in freezer while making sauce which expedited the wait time. Such a great recipe and the tartar sauce is perfect!! Thank you for sharing, definitely be making again and again. I’ve never been to Maryland but these are tasty little critters. Made em with fresh caught dungeness and red rock crab. Substituted sour cream for mayo because I didn’t have it. Long prep time but worth it. I made this tonight for my hubby, OMG!! It was the best!! Your tarter sauce was soooooo good. The Crab Cakes were perfect! Just the right seasonings. I made exactly as written. Thank you!!! This is the best I have made so far!! Looks very nice. I am staying away from carbs, can you skip the panko? Hi Magnus, I haven’t made them this way so I can’t say if it will impact how they will hold together, but you may want to try these with coconut or almond flour. Please LMK how it turns out if you try it! Hi Eddie, I’ve never used pork rinds so it’s hard to say. If you can get them to a consistency that’s similar to panko, perhaps it will work, but I can’t say for sure without trying it. I’d love to hear how they turn out if you try them this way! Best crab cakes I’ve ever had. Made it without celery and doubled the recipe. Ended up with 16 medium size crab cakes and were very filling. Please give me the recipe for 4 adults. Hi Carmen, you could multiply the recipe by one and a quarter. (To make the math a bit more simple, you could make 1.5 times the recipe and refrigerate any leftovers.) Hope you enjoy! 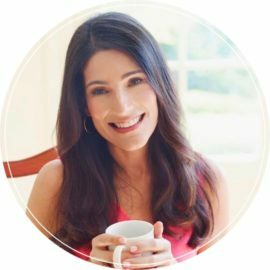 Hi Jacqueline, I generally am not crazy about the way crab freezes, but a number of readers have mentioned that they have frozen them successfully (after cooking them), so you could definitely give it a try. Hope that helps! Hi Carol, I’d suggest you use a combination of baking and broiling; bake them in a 350-degree oven on a lightly greased baking sheet for about twenty minutes, or until hot (and it’s not necessary to flip them). Then I’d slide them under the broiler for about a minute to get them golden brown on top. Enjoy! Omg these were an absolute hit for my friends on Sunday. The room got quiet and all you could hear was mmm sounds. Super simple. I followed the recipe to the letter. Don’t change a thing and you will get mere perfection! Days later and my friends are still talking about these crab cakes. I have never made crab cakes before but these were restaurant quality! Sooooo good! I’m from Maryland, and this recipe is one if the BEST we’ve had for a long time! Perfect proportions and seasoning. We prefer ours broiled, so I used traditional bread crumbs instead of Panko, a little melted butter on top, then broil for 12-15 minutes. Perfect! I made these crab cakes tonight for a crowd and they were by far the best crab cakes I have ever made. The ingredients did not compete or overtake the crab. It was delicate, held together well and was tasty. Great recipe and I will use it every time I make crab cakes in the future. These are so good!!! I’ve been wanting crab cakes for some time and thought about going out at first. Glad I didn’t!! I had been searching for the perfect simple but delicious crab cake recipe until I found once upon a chef. Your recipes are amazing! These are easy to make and very delicious. I’ve impressed quite a few palates so I’m definitely buying the cookbook. Hi Jane, I’d reheat them in a 350°F oven for 10 – 15 min. Enjoy! Why does it say line a baking sheet with foil to go on to say to pan fry??? Hi Erin, the baking sheet is just something for you to put the crab cakes on to refrigerate them prior to cooking. Hope that clarifies! Hi Maureen, Cooked crab cakes will keep in the fridge for up to 2 days and reheat nicely. I generally don’t love the way crab freezes, but a number of readers have mentioned that they have frozen them successfully (after cooking them), so you could definitely give it a try. Hope that helps! I made this recipe tonight. Delicious. Exactly what I want a Crab cake to taste like. The texture was perfect. How many cakes does this make? Hi Helen, this recipe makes 6 crab cakes (enough to serve 3 adults as a main course). Hope that helps! Can I make these a day in advance? Sure, Amy, the reheat nicely! FANTASTIC!! !Would not change a thing! your recipe for crab cakes seems like it was copied from the fannie farmer cookbook — only the amounts of ingredients are different. Hi Ronnie, I’m not familiar with that recipe — this is an original. That said, Maryland crab cakes are classic so most recipes will be pretty similar. This makes me want to go to the beach! Thanks for this – trying to make a “crabcake” out of heart of palm and looking for a simple, quality recipe to help guide me. Delicious but I would add more bread crumbs and less mayonnaise the next time. I have made these twice and both times fantastic. I made them with jumbo lump tonight (bought by mistake) and I have to say- with the addition of probably 1/4 c breadcrumbs because I could see they weren’t binding as well (again, my fault)- they were just as delicious. My entire family went nuts for them. Thank you for another great recipe. The best crab cake recipe! I have made these a few times now, and this is definitely the only recipe I will use. Thank you! Made these crab cakes and followed the recipe but couldn’t keep them looking pretty in crabcake form fell apart didn’t come together at all. Hi Sara, Sorry you had trouble getting them to hold together. Did you use jumbo lump crab meat? Sometimes if the lumps are too large, they can be hard to form into cakes. You don’t want to shred the meat, but smaller lumps work best. Hope that helps. After I reviewed this delicious recipe a few days ago, I wondered how the same ingredients would taste using shrimp or mild white fish like tilapia and pollock. Happily I can report that whether it’s a fish cake, shrimp cake or crab cake… this recipe is delicious. Shrimp, like crab, as one doesn’t shred with gentle handling so it represented lump crab better than the white fish. Tilapia and pollock fell apart easily, but that didn’t take away from the delicious flavor. I want to try salmon and cod next. Btw, successfully cooking these in oil in a pan gave me confidence to try Jen’s “restaurant-style Salmon she emailed a week or so ago. Delicious!! I tried this yesterday. My husband and I loved it. Prep was quick and easy and the crab cakes were delish. I’ve been recommending it to family and friends. Sure, Doreen – that will work. Enjoy! This is the second time I’ve made these. Last time the Old Bay made them much too salty. This time I omitted the Old Bay. For me and us, perfect! Other than the Old Bay I followed the recipe exactly. Next time I might add some finely diced onions but that’s just me tinkering. We aren’t tarter sauce fans so instead we have small bowls of 1000 Island dressing cocktail sauce along with. I prefer these on their own. Great recipe, Jenn. Well done! Made these for Valentine’s day dinner and my husband said these are the best crabcakes he had ever tried! He orders them at restaurants all the time, so he should know. They truly were delicious! I did half the recipe and made 4 crabcakes, 2 for each. Also, instead of mayo I used mashed avocado (both in the crabcake and for the sauce). To die for! Will make these many more times for sure! I live in the U.K. Old Bay seasoning is not available here ( at least I haven’t seen it). What else can I use as an alternative? V.T. Hi Vicky, I don’t know of a great substitute for Old Bay but it’s easy to make your own. Here’s a recipe. Hope that helps! OMG!! Made this for my wife and I for Valentine’s day. SOooo good! I omitted the celery but I will add some the next time for a little fresh bite in the cakes. I also used fresh bread crumbs instead of panko (didn’t have panko). Will definately be making these again. I use finely crumbled Ritz Crackers for my filler. Adds an additional layer of flavor with no dryness. Delicious and easy. So much so, that we bought another two pounds of crab meat, made a bunch, cooked lightly and put in the freezer. jenn, I’d like to use diced bread instead of panko. my question is how many pieces of bread equal 1/2 cup of panko? thank you. BTW, say hello to your mom for me. Will do, Kenny! I think it would be 1 – 2 slices (and I’d dice it pretty finely). Hope you enjoy! Hi, theses look delicious I plan on making these for dinner tonight. Can I use vegetable oil instead of canola oil to make the crab cakes? Definitely – hope you enjoy! Sorry but this recipe is not a Maryland crabcake.. You want to make a real Maryland crab Cake? Follow the recipe on the can of Old Bay seasoning. And best crabmeat to use is backfin or lump. Thank you for this recipe. These crab cakes are delicious! I’ve tried 2 other recipes and they’re– just “gummy” inside. The key to yours, I think, is an increase in seasoning, a reduction in mayonnaise, and the use of panko instead of the traditional, fine breadcrumbs. These are really flavorful! Thanks again. This recipe rocks! Made this for our son-in-law’s birthday dinner and everyone raved about them! Thank you!! My family loved this recipe! A lot of flavor and very simple to make. I fried it in coconut oil, and you could also fry it in avocado oil too. Covered the patties in an outer layer of Panko, lightly seasoned with Old Bay. First time making crab cakes, but I now rule the kitchen, everything within it, and all who enter. Speaking of ruling the kitchen….YOU, Jenn, are the real power behind the throne!!! I’ve made so many of your dishes I’ve lost count!! While. I’ve like some better than others, there’s never been any that are Bad. Most amazing to me, the recipes are pristine…they all work! You’ve got the crown, girl!!! Can I use crab legs? Do I boil them first? Or start raw? I have 10 pnds? Help? Sure, Michael – but you would definitely need to boil or steam them first. 2nd time I’ve made. Excellent both times! Excellent, excellent recipe. I served these as appetizers on Christmas Day and they were a huge hit. This is the first time I’ve made crabcakes that actually held together so I was very pleased. The sauce was excellent, full of flavor and easy to put together. Thanks for this wonderful recipe. I will use it often! I am from Maryland! And I can assure you 100% that NO true Marylander would EVER add celery, onions and the like to a crab cake!!!! The flavor is too delicate to be overrun by additives!! I have eaten ONLY Maryland crab cakes for over 50 years now! Wondering if I misunderstood, there is no onion in this recipe and isn’t Old Bay made from celery? Hi Mat, No, there is no onion in the crab cake recipe (although there is a little in the tartar sauce). And Old Bay is a combination of a number spices, one of which is celery salt, but it isn’t made from celery. Hope that clarifies! Sorry! I just saw your salmon cake recipe. Very similar ingridents so may do a combo. Do you think salmon would work in place of the crab? Hi Cheryl, If you’d prefer to use salmon in place of crab, I’d suggest this recipe instead. Hope that helps! Jen, can your Maryland Crab Cakes recipe be halved as is? Sure, Jim – that’s fine. Enjoy! 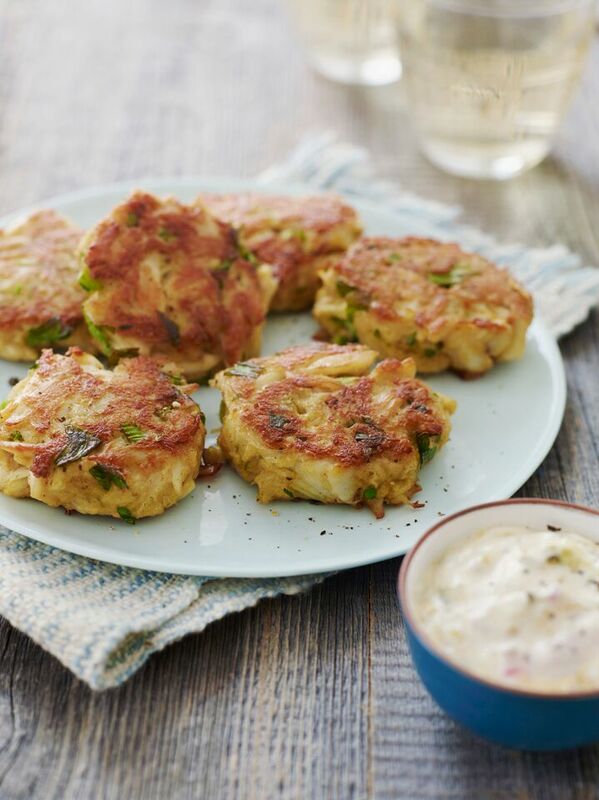 The absolute best crab cakes ever…easy to make..easier to devour…. Is it possible to make these crab cakes into meatball size (Swedish meatball) and quickly deep fry? I would like to do this early and then reheat, what are your thoughts and recommendations on how to reheat? Hi Kathie, I think that would work and I’d reheat in a 350°F oven for 10-15 min. I’d love to know how they turn out. Are 2 pds of fresh crab meat enough to make 11 crab cakes? Yes, Marialisa, that should work. Enjoy! I made this recipe using canned, lump crab. The recipe was good, but fresh crabmeat would have been superb. This has become my go to Crab cake recipe. The only alteration to the original recipe is that I like to saute a chopped shallot and add it to the mix. I’ve made these twice now and they are really good! I’ve made the “authentic” Maryland crab cakes that natives swear by and they’re inevitably too wet/slimy inside or less flavorful than I prefer. The difference, I think, is that your recipe uses 2 eggs, uses a greater measured amount of seasonings, and calls for less mayo. I’ve just really looked at your site for the first time and it is impressive! I will be coming back again and again! I do not live near a store that sells fresh seafood. Would it ruin the recipe if I use canned crabmeat? Hi Elizabeth, These are definitely best with fresh crab, but canned will work. Hope you enjoy! Made crab cakes for the first time today. I didn’t have fresh parsley so used dried and didn’t have Dijon mustard so used regular. This recipe was easy and delicious. Will definitely use this recipe again! Hello! Is it possible, after forming the crab cakes, to let them sit overnight before cooking them? So sit for about eight hours instead of one? Thank you!! Sure, Casey – they’ll hold together even better that way. Hope you enjoy! Just wondering if you broil or bake and what temperature do you bake them at? Only states to get the oil hot and for a person who is not an average cook it’s confusing, need specifics as baking and broiling are totally different. Hi Susan, I’d suggest you use a combination of baking and broiling; bake them in a 350-degree oven on a lightly greased baking sheet for about twenty minutes, or until hot. Then I’d slide them under the broiler for about a minute to get them golden brown on top. Enjoy! Yum! Best crab cakes I have ever made! According to my husband I will be making these a lot! Good thing they were also easy to make. Made it for my father-in-laws birthday party and everyone loved it! So simple too! I made these using frozen crab meat from Trader Joe’s, and they were amazing! Definitely a huge hit with everyone. The tartar sauce was also wonderful. Thank you for another perfect recipe! Hey, Jenn! Fellow DC native here. I just started learning to cook and this was one of the first recipes I’ve tried. I only had 8 oz of crab so I made half the recipe, left out the celery, and wow, I cannot believe I actually made something this good! I am so excited to learn more now, thank you! I made the mayo from the NYT’s small batch mayo recipe and used it in the crab cakes and tartar sauce. So good! The tartar sauce turned out perfectly. Thanks again for this site and congrats on your cookbook! Looking forward to trying out more of your recipes! I’m planning to make these for a dinner party. However, I usually prefer broiled crab cakes. Have you ever cooked these in the oven? If so, can you please give me instructions? Hi Catherine, I think these are best when pan-fried, but you can bake them in a 350-degree oven on a lightly greased baking sheet for about twenty minutes, or until hot. Then I’d slide them under the broiler for about a minute to get them golden brown on top. Enjoy! I just put these together and realized I bought 8 oz container of the crab !!! I added a touch more bread crumbs an put them in the refrigerator to firm up. Do you think they will be alright with less crab meat in them ?? I am going to rate these as a 5 because they have great ingredients and I know they would be good. How’d they turn out, Char? Sometimes we have to make do! Does the crab need to be cooked first? Probably a dumb question but I have to know lol. Thank you. Hi Rudy, When you purchase crabmeat, it is already cooked and ready to make crab cakes. Enjoy! Love.Love.Love. this recipe! The only thing I do differently is to put a sliver of a pat of butter on top of each crab cake then bake in my Breville Smart Oven @350 for 30 min…..perfect every time! Theses crab cakes were phenomenal! Served with Jen’s tangy cabbage slaw and fresh corn on the cob – fantastic. The crab cake recipe was a cinch for a novice like me and got raves from my husband as well. Highly recommended just as written! Thanks Jen!! Made these tonight for a crab lover and a non-crab lover! Hubby ate one and said “pretty tasty!” Served with a nice side salad, and a glass of rose’….was perfect. I added garlic chives from my garden to the batter and browned them in “brown butter”. Gave them a nutty taste and who doesn’t like browned butter……??? Will be freezing the rest……yum!!! Tks! This recipe is spot on delish! I have been making salmon cakes with panko and was looking for a good crab cake recipe, as soon as I saw this one I was excited to give it a shot. My family of five devoured these! I got a pound of crab meat at Costco for $22.99 in NJ if that helps. They were awesome! These were AMAZING! So easy too! I cooked all of them and froze the leftovers. They reheated very well! Yummy! I am making them for family members because I’m so impressed with how great they turned out! I can’t wait to make them again for myself! I haven’t even tasted these yet, but the recipe tells the story. It isn’t loaded with overpowering spices, onion and such that will kill the crab flavor. Congratulations to the chef. Apropos the tartar sauce, try chopped dill in place of the sweet or a touch of each. Im not a fish/crab person usually. I made these for the first time. Marvelous and easy. Thank you so much foR tue recipe. I am making your Maryland crab cakes for tomorrow evening (friends for dinner). I must have made them smaller because I doubled the recipe and made 24! Right now, I am keeping them refrigerated & covered with plastic wrap until I pan fry them. I will have leftovers. How should I best freeze them? Cooked or raw? We are six adults, there is other stuff. Doubtful we will eat all of them. Although we haven’t tasted them yet, I am giving it 5 stars due to the ease of preparation and the simplicity of the recipe. Hi Carina, Cooked crab cakes will keep in the fridge for up to 2 days; uncooked cakes may be frozen for up to 1 month. Hope you enjoy them! Absolutely the best crab cake recipe ever. I was born in Baltimore and grew up in the Mid-Atlantic and these are 100% authentic; the way a crab cake should be. Simply fanstastic. This receipe does NOT state what temperature to bake the crab cakes at? Hi Krista, Click on the recipe tab, then scroll down beneath the recipe and you’ll find the instructions. Made it for the first time and the crab cakes were awesome! My husband loved them too. The recipe was easy to follow. Had to watch the salt so I didn’t add salt and didn’t have the celery and fried them in olive oil. So delicious. I will definitely make this great recipe again. This recipe is great, however not nearly enough old bay seasoning to our liking. I’m going to double it next time and see if that helps. Besides that, it’s a good recipe. I baked mine at 350, per another review but found that it took too long to brown them. Next time doing 375. I lost my recipe and tried this one and glad I did! Made a few changes – we watch our salt intake, so used less Old Bay seasoning (1/2 tsp. ), no salt (since the Old Bay had celery salt), used gluten free panko crumbs. I didn’t have time to refrigerate the cakes for an hour, so skipped this step. I baked the crab cakes because I don’t like to fry. Heated the oven to 350 F – sprayed oil on a rimmed cookie sheet and also on the crab cakes (this makes a nice brown coating), they cooked for 15 minutes, then flipped over and cooked for 10 additional minutes. I also put the sheet on the bottom rack of the electric oven. Definitely will make again! This was my first time making crab cakes and I knew I wanted a recipe with plenty of crab & very little filler so this recipe fit the bill. As always, meticulous instructions which I really appreciate; I had no idea that you needed to check for sharp cartilage/shell in the crab meat – that was a great tip because I found a coupla little pieces. Made these for my husband for Father’s Day & he absolutely loved them. Turned out perfectly; nice and ‘meaty’ with plenty of crab flavor. Great recipe! What is old bay seasoning. I live in Canada. Would there be a substitute? Celery changed the texture to my disliking so I’ll skip it next time. Otherwise the recipe was delicious. Try Old Bay on butter mashed cauliflower. Could these work as minis? I would like to serve as an app at a casual cocktail party- too fragile to put a toothpick in? Hi Nancy, You can definitely make them as minis but you’re correct that they are too fragile for a toothpick. Enjoy! As always, thanks for another great recipe Jenn. Our neighbour brought us some fresh dunganess crab. I froze what we couldn’t eat and used this for the crab cakes. I let the meat drain on some paper towelling first after it had thawed. I didn’t have fresh celery, so used 2 teaspoons of celery seed. I portioned the cakes out with a half cup measuring cup for 6 cakes, and gently shaped. They browned beautifully in the frying pan, 4 minutes on each side. So delicious, and not fishy tasting. Delicate and fresh is what I would describe. We loved them!! Our friend also brought us some shrimp, I am looking forward to trying the shrimp tacos with avocado salsa. That sounds awesome! Excellent recipe–thank you! Made it for the first time this past weekend with blue crab meat from the Eastern Shore–my husband said they were the best crab cakes he’s ever had. As native Marylanders, my son and I agree. I love this recipe, today I need it gluten free. What else can I use to replace bread crumbs? Hi Sharon, most grocery stores carry gluten-free panko or bread crumbs. Also, Worcestershire sauce very often contains gluten, so make sure you look for a gluten-free version. These crabcakes were absolutely outstanding and the sauce is a must! This was the first time that I’ve ever made crabcakes and as usual, your recipe was foolproof. You never fail to make me look like I know what I’m doing. Thanks for another blue ribbon recipe! Made these as a lite dinner for my wife and me last night. Easy and delicious… are there two better words for cooking food? I haven’t tried many other crab cake recipes simply because the few I have tried have been neither easy nor delicious. Jenn, I had a very good feeling this recipe would be great when your narrative said “go light on the filler.” These were perfect!! What can I substitute for old bay seasoning. Hi Barbara, here’s a recipe for homemade Old Bay seasoning. (And it’s a delicious seasoning for all kinds of other foods including popcorn, fries and egg salad. Made these last night and they were absolutely amazing! great recipe the family (from Maryland / PA) absolutely loved them. This recipe is AWESOME! I have been using this recipe for 2 years now and follow it to a T. I have never found a better crabcake recipe – I highly recommend this one! I apologize if this question has been asked/addressed but can you freeze these crab cakes? If so, is it recommended to cook them first, freeze and then reheat? As always, thank you for such amazing and delicious recipes, I cannot wait for your cookbook to come out! Glad you enjoy the recipes, Celeste! I generally don’t love the way crab freezes, but a number of readers have mentioned that they have frozen them successfully (after cooking them), so you could definitely give it a try. Excellent. I broiled them but think they would have been better lightly fried in butter. The crabmeat in md. Was 40 dollars for backfin. This recipe was good. Just enough to hold crabmeat together without overpowering the flavors. Hi Jenn. Beautifully balanced recipe- celery ratio just right and turned out perfectly. I didn’t have the panko so used sourdough crumbs I made myself. Also we can’t get Old Bay seasoning in Australia so just used salt & pepper which meant you could really taste the crab. I have a suspicion that you Americans are just used to the taste of Old Bay and expect it in crab cakes. Anyhow, thanks for the website and all your work and the I’ll definitely be looking to make other recipes. There are several copy cat recipes for Old Bay seasoning that you could put together from common spices, just do a search for it. Result should be close enough. Chris, I am curious what type of crab you used for your crab cakes in Australia? What crab down under is comprable to the blue crab of the Chesapeake Bay? Delicious! My son and I loved them! I made them in the morning before work and just cooked them when I got home. Definitely my new favorite crab cake recipe! Don’t forget the tarter sauce; yum! Skip the celery. Used roasted red pepper mayo instead of Dijon mustard and pretzel crumbs instead of panko. Pantry shortage but pretty darn good. Also, don’t like canned crab. Use crab leg meat to ensure you get the best cakes. This recipe is EXCELLENT! I altered it slightly by adding garlic powder and black pepper. Also, instead of fresh celery/psrsley, I used celery seed and dried parsley. My family was asking when I’d make more crab cakes as they were eating. I will be adding this recipe to my collection… one more thing, I didn’t have an hour to allow the crab cakes to sit in the refrigerator. I mixed, shaped and fried them immediately and they were perfect! WOW! Another great recipe from you Jenn! I followed the recipe exactly as written and it turned out perfect. We ate it plain without the tartar sauce. My husband said he wasn’t that crazy about crabcakes but I love them. He was ooohhhing and ahhhing while he was eating it. I asked if he wanted to take the leftover for lunch the next day. He happily agreed. Thank you for sharing your amazing recipes! My husband and I had the crab cakes for dinner tonight. They were wonderful! We both agreed that this will be our “go to” recipe. Thanks. Let me confess I altered the recipe a tiny bit. That said, these were the BEST crab cakes I have ever tasted; tender, moist and bursting with fresh crab flavor. Alterations: I’m not an Old Bay fan, so I replaced it with a half-teaspoon sriracha. I’m also averse to salty food, so I cut the quarter-teaspoon to “a pinch” and that was plenty. I AM a fan of butter, so I sautéed the cakes in one part canola and two parts unsalted butter. Rich! Finally, I inadvertently minced more parsley than the cakes needed, so I added the leftover (about 1.5 tablespoons) to the tartar sauce which turned out delicious. Once the cakes were consumed, we were still eating the sauce. We’ll be eating more crab the rest of our lives, now that we have this recipe! My daughter loves these crab cakes she can eat them every day, even though that they fall apart a bit during frying they are still delicious, the amount of spices is just right, nothing to add, definitely a keeper. Yes, Kathy, you can. I think you should do a combination of baking and broiling; I’d bake them on a baking sheet and When they’re about done baking, I’d stick them under the broiler for a minute or two to brown the tops a bit. If baked, what temp and for how long? Hi Carol, I think these are best when pan fried, but you can bake them in a 350-degree oven on a lightly greased baking sheet for about twenty minutes, or until hot. I’d slide them under the broiler after that for about a minute to get them golden brown on top. Hope you enjoy! I live in a smaller rural town in CA, and really, really want to make these crab cakes, but don’t have a clue about how to get the best tasting crab. We have a Safeway and a Save Mart here. Can I use canned crab meat? Which brand would you recommend? Would it be too salty? Do stores with real meat counters sell fresh crab meat? Thanks for your help. I can’t wait to make these. Hi Ann, It is definitely best with fresh crab, but canned will work. Ask the at the fish counter what they recommend in terms of brand. Hope you enjoy! Hello, can I add imitation crab meat with lump crab meat? Hi Kim, I haven’t tried it with imitation crab, so I can’t say for sure, but I do think these would be best with the real thing– sorry! We use imitation every tone and they taste amazing!! My husband and I were pleasantly surprised with this recipe! Very easy to make, the ingredients and directions were precise, and the result was delicious. My only regret is that I didn’t try the tartar sauce! Hi Nicole, Old Bay seasoning is a combination of spices including mustard, paprika, celery salt, black and red pepper and more. It’s widely available in the U.S. but if you have a hard time finding it, here’s a recipe for homemade Old Bay. Made these new years eve. Followed recipe as directed. I always want to try it as intended. They turned out great and held together well. Refrigerating prior to frying them is a must. Will definitely make these again. Tartar sauce was equally awesome, simple but nice side. Thanks. Fantastic recipe! Love that the crabmeat is the star. We replaced the celery with green peppers but I’m sure the celery would taste great as well! I wasn’t a fan of crab cakes until now! The crab cakes in restaurants have a lot of filler and I don’t get too much of the crab taste. But this recipe definitely showcases the crab in crab cakes. Delicious! My family couldn’t wait for me to make the sauce so we just had it with lemon. I served it with your corn muffins and it was filling. Thank you so much! Will try with Dungeness crab next time. These crab cakes were amazing! I made these for Christmas dinner and they were a huge hit. Thank you for the tip about checking for shells because there were quite a few and I would’ve just dumped the crab meat into the mixture had you not included that tip. Thanks for the recipe. Hi Jenn, I made this today for Christmas Eve dinner. Very delicious, my husband and sons said the best crab cakes! The tartar sauce was so good. Minimum fillers and maximum crab! I served with grilled jumbo shrimp, homemade coleslaw, sautéed spinach and wild rice. Thank you so much! I tried this for the second time – right into the garbage. Too much of everything except crab meat. Unable to salvage. Hi, I’ve made this recipe before, these are awesome. This time I’m wondering if I can make them today, and look them tomorrow for Christmas, or will they be too dry? Yes Tracy, that’s perfectly fine — just cover them tightly with plastic wrap. Happy Holidays to you too :). I made a gluten Free version using udi’s whole grain bread instead of the panko, since the kids are wheat sensitive. It came out perfect! The tartar sauce was also two fist bump hit! I’m going to make these mini and serve as an appetizer for Christmas. I was wondering would I bake or Broil them or both? Also do you have any other recommendations when making them mini? Thank you! Hi Ashley, I think you could do a combination of baking and broiling– I’d bake them on a baking sheet and When they’re about done baking, I’d stick them under the broiler for a minute or two to brown the tops a little. Enjoy! These were very good but next time I will add some zip like diced jalapeno. The tartar sauce was also really good. This is a great recipe! Having grown up in Baltimore, I have tried many recipes for Maryland style Crab cakes. To freeze, cook the crab cakes first. Cool completely and wrap with plastic wrap. Then play in a heavy duty freezer bag. Thaw in the refrigerator and then reheat. Can I fry them in the morning or day before then bake them in the oven to warm before we are ready to serve? Hi Jackie, Yes they do reheat well. Enjoy! I made these last night for a a few friends and they were fantastic! This was the most perfect recipe. Simple and delicious!!! Will not or would not change a thing. Thank you for a glorious dinner. Can I make these in advance & freeze them? Hi Susan, I generally don’t love the way crab freezes, but a number of readers have mentioned that they have frozen them successfully, so you could definitely give it a try. Do you have a suggestion if I don’t have dijon mustard at hand? Hi Ann, you could omit the mustard, use whatever mustard you have or use a little dry mustard. This is by far the best crab cake recipe I have ever had! I follow the instructions, adjusting the amounts based on how much crab I have on hand and I am amazed at the simplicity and taste of these delicious cakes. Thank you so much! Can you freeze once assembled into cakes but before cooked or do you sauté first? Can you bake them in a 400 degree convection oven on a cookie sheet lined with parchment paper instead of frying? Hi Carol, I think that would work. When they’re about done baking you could stick them under the broiler for a minute or so to brown the tops a little. These are the most fantastic crab cakes! We have a summer place in the Pacific Northwest and I am always given dungenuss crabs from my neighbour. I have searched and searched for the perfect recipe to make the work of shelling worth it! I have tweaked it by adding 2 green onions finely chopped and 1/4 cup bell peppers finely chopped! I also place them in the freezer for a bit so they hold shape. I also freeze them and then enjoy summer for months into the year! Let me start this review with cooking is my passion. Other than my children and traveling nothing makes me happier than to cook a great meal for family and friends. I’m known for my cooking and usually don’t fail at it…except… I have never had good luck with crab cakes. They either fall apart, are too salty, fishy or too much filling. I just never could get it right and it would upset me because they are not inexpensive to make. Well thanks to this recipe I now have had success. I made these for company accompanied with shrimp scampi, medallions of beef tenderloin with a cab reduction, scorched green beans and a caprese salad. My company was thrilled and I was extremely pleased with how it all came out. I didn’t change a thing. I made the cakes early in the day and cooking was a breeze. I used Chicken of the Sea lump crab meat. I have to say I was a bit nervous about using canned crabmeat but at $18 a 1lb can the fish market told me it would be fine so I chanced it. Glad I did. Six meaty, flavorful, solid cakes. Thank you so much for this great and very easy recipe. It will now be passed down through the generations in my family. A friend came by my apartment with 2 zip lock baggies full of Alaskan King crab. Here brother, this is for you. There were crab legs the size of a hammer handle in there, full of crab meat! I am really not a big crab eater and was wondering what to do with it. Jenn’s crab cakes looked like a great solution, and it was! Never made these before so I followed the recipe very closely, even chilled them in the fridge for an hour before frying. I haven’t eaten much crab in my life, but this is the best way I have ever eaten it. I tried the tartar sauce but much prefered them with just fresh lemon juice squeeze on top. Really good! Delicious! I have never eaten crab cakes in Maryland, so I have no opinion about “authentic”. All I know is that these are wonderful. I also made the green beans with shallots (divine) and the cornbread muffins (outstanding). Another wonderful meal from the best food blog ever. Hi Jenn, Can’t wait to try these – am sure they are delicious like all your other recipes! One question – what brand of relish for the tartar sauce do you suggest? I find it so helpful when you add these suggestions as it really makes a huge difference. Am sure they are not all the same. Thanks for the great eats!! Hi Janet, when it comes to relish, are they are essentially the same so you really can’t go wrong. I think I’ve just used the store-brand relish for the tartar sauce. Hope that helps! i was craving Devon’s crab cakes and this recipe was very awesome.. These were prenominal! First recipe ever that kept the cakes together – despite not having time to chill them. Thank you so much!! Can I use the less expensive backfin crabmeat for this recipe. Can these be frozen prior or after cooking? Made these tonight for company and all swooned! Well done; a great recipe. I baked mine however at 400 for approx 12 min. Happy Holidays! Outstanding crab cakes! Do you have a paella recipe that you can share? After frying the cracbcakes, can i freeze them? Generally I don’t love the way crab freezes, but several readers have commented they have frozen them with success, so you could certainly give it a try! I froze the extra in patties. I then pulled them out as needed, thawed and fried. My family actually prefers the frozen. Wow, great to know- thanks Deanna! I have made these before and loved them. I have always served them warm, but I would like to take them to a party and wondered if they would still taste as good at room temp? Hi Mary, I suspect they would be tasty at room temperature. I wouldn’t suggest leaving them out too long though as you don’t want to risk them spoiling and upsetting people’s stomachs! Sounds like a very good recipe. Its a different recipe I use since I live in Maryland but I will certainly try it next year when crabs are available next spring. How much do you really spend to prepare maryland crab cake using a 1 pound crab meat? Hi Danilo, The price ranges from $25-$30. I noticed you use one half cup for regular sized crabcakes but how much crab mixture do you use for appetizer size. Please answer quickly as party is this week.? I love crab cakes: Old Bay! Tartar sauce! Lemon wedges! Sadly, I have developed a sensitivity to crab and no longer can eat it. I have made these cakes several times substituting 16 oz. canned salmon or tuna for the crab. I’m sure they would be even more delicious with the crab – but I thought I would let your readers know that it IS possible make a substitution for the crab if necessary and they turn out really well! These are easy to make – I like to put them together over lunchtime and they are chilled and ready for easy finishing for supper. Hi Jenn, my son is allergic to the eggs and wheat in this recipe. I usually sub mayo for yogurt or sour cream but I’m stumped on what to use as a binder in place of the eggs and breadcrumbs. Please do you have any suggestions? Hi Lisa, I think more mayo or egg replacer would work, and gluten-free breadcrumbs will be fine. Hope that helps! Can the crabcake mixture be used as a stuffing with trout that will be baked? Hi Kate, Yes, that should work, although you might want to use only one egg since you don’t really need it to hold together. I used all the ingredients except celery and my crab cakes seem very wet? When you put them in the fridge for an hour while they hold together better? Hmmm…they shouldn’t be too wet, and they should hold together when you form the cakes initially. If they aren’t holding together and the mixture seems wet, add some more bread crumbs and that should do the trick. This is the best recipe I have tried yet. I have tried a lot too. The Ritz cracker one was ok but the crackers took away from the flavor. The Panko crumbs were perfect and the amount of the ingredients are perfect. I would only not use the salt it isn’t needed for me. My question is can I freeze these before I cook them and then use my vacuum sealer to freeze them for a couple of months? Hi Sandy, Yes, that’s fine. Glad you enjoyed them! Amazing! My bf thinks I should open my own restaurant because of these. And I even used the celery AND good quality canned crabmeat. Perfect and easy! I followed your recipe exactly and they came out wonderful, better than the crab cakes at any restaurant. Thank you, it’s a keeper. I’m wanting to make these crab cakes at the trailer this w/e and I checked the Reviews and guess what there is a link for “Old Bay Seasoning”. This is tooooooooo funny because I was just going to email or question you on how to make this seasoning (because I have not seen it in Southern Ontario Canada and if it’s store bought – I can make it (just need the recipe)). I’ll let you know how crab cakes work out with my family – what’s NOT TO LOVE ABOUT these little tid-bits of goodness. We love these crabcakes! My husband loves the slight crunch to the crust. True Maryland crabcake recipe, excellent! Discovering your blog has made me excited to cook again! Is there a substitute for Old Bay Seasoning? I live in Philippines and it’s not that easy to find. I want to try this recipe but I don’t know what pinko is? Hi Elizabeth, Panko is Japanese breadcrumbs — they are readily available in most grocery stores. Hi Deanna, Unfortunately, crab meat does not freeze well. Sorry! Thank you. I did put some in the freezer, so I guess I’ll just see what happens. lol I followed the recipe pretty closely except I used fresh claw meat – which is what I had on hand. They turned out excellent. Thanks again. I added an egg to the recipe to help to hold the cakes together even if using jumbo lump. I didn’t add the celery. These were very very good!!! these . were . EVERYTHING . I had never made a crab cake before in my life but have eaten plenty of them, lol. These came out perfect, so delicious. My Husband was raving about them. I was concerned because as I made them into cakes they felt really wet, but I put them in fridge for an hour like recipe said, and they cooked perfectly. They all stayed together and looked great. Hi Jenn, We love our seafood in Australia so wanted to try your receipe for a Birthday dinner last night. Glad I did they turned out beautifully and were a great hit! I didn’t have enough fresh crab meat (blue swimmers) for the full receipe so I added some fresh balmain bug meat (similar to lobster) which worked. Served with Coleslaw, corn-on-the cob and sauteed potato slices. 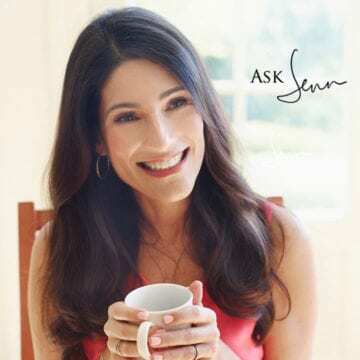 Hi Jenn – This recipe looks delish! I am going to make them into mini crab cakes for a party tomorrow. Would you be to tell me what size they should be and what temperature to bake them on and for how long? I apologize for all the questions, but I definitely want to get them right! Hi Teisha, I would make them bite-sized (about 1-1/2 in diameter); you may need to shred the crabmeat a bit so that they hold together since they are small. Bake them at 350 until just golden — can’t say for sure how long since I usually fry them but I’m guessing 15-20 minutes. When you’re making the mixture, you might want to test bake one crab cake to make sure they hold up in the oven. If they are too dry, you can try adding another egg like some others have done. Loved the way these tasted, but had a lot of trouble making them stick into cakes. Added another egg, boom, problem solved. Do you think if I refrigerated these for more than an hour they would be ok? I’m worried about them drying out? I want to prep these before I go to work in the morning (9am) and cook them once I get home (5pm). Yes, absolutely. Just cover them with plastic wrap and they’ll be just fine. Thank you Jenn! Cant wait to let you know how they turn out! 🙂 Im cooking them for hubby on Vday. Just wanted to let you know that these crab cakes turned out perfectly! I made them on Valentines day Eve…Left them in the fridge all night/day and prepared them in the skillet for dinner on Vday. I left out the celery like other reviewers. The Husband absolutely loved them and we both agreed they tasted like the real deal! We lived in DC for 6 years and these crab cakes definitely had that authentic Maryland taste to them. Thanks so much for a staple recipe!! We went crabbing up the estuary and caught around a dozen blue swimmer crabs. My Aussie In-Laws always just boil the crabs and make crab sandwiches with salad and a seafood sauce (ketchup mixed with mayo). Although very tasty with fresh crabs I wanted to try something a bit more adventurous! I found this recipe and used the remaining 6 crabs to make your Maryland crab cakes. The Old Bay seasoning is hard to find Down Under, so I substituted it with 1/3 tsp of paprika, cayenne pepper, celery salt and large pinch of ground cardamom and black pepper. I also used 60g of gluten-free bread crumbs instead of panko (my wife is coeliac). The cakes bound together nicely before going into the fridge for an hour. I fried them up 4 mins each side and they looked (and tasted) awesome. Absolutely delicious crab cakes. Big hit with the family although I might have put a bit too much cayenne pepper in! Perfect for my wife and I, but the ‘olds’ found them a bit too spicy! Total Fail! I spent a lot for this crab meat. A wreck. Hi Christine, So sorry your crab cakes didn’t turn out. May I ask what went wrong? I work at an upscale italian restaurant and I made these yesterday and brought them in, even the chef was impressed, thanks. I making the Maryland crab cakes and I think my mixture is to moist and the crab cakes won’t form into a ball like I think they should there real loose what do I do? Hi Matt, The mixture should just hold together; the cakes shouldn’t be pressed too “tightly.” Once the cakes are formed, chilling in the fridge helps them stay together. That said, if you are using lump crab meat, you may have to break the lumps apart just a bit to get them to hold together better. Need to make 12 do I double the recipe? I want to make these as appetizers. Do you think they will hold well as mini-cakes? Hi Martha, Yes, but you might have to break up the lumps of crab meat a bit so they hold together. The crab cakes were awesome!! I’m originally from Maryland, and these were spot on. I made them without celery, but only because I don’t enjoy celery in my crabcakes 🙂 I bought the crab meat from Costco, which was a good deal for the quantity and quality of the meat. I also made the cornbread, and it was a perfect side. Definitely making this again! I want to know if I can do this recipe with a canned crab or only with fresh crab. Thanks. Hi Hilda, It is definitely best with fresh crab, but canned will work. Drain the crab & soak in milk for an hour or so. Drain in strainer. This is for refrigerated lump meat. Canned so not recommended use it for dips. following he luckily begins to chew for it, tell him they have a wonderful wow and thus go on with your day. $300 for trainers meets any of these word groups a long time before understand it the saying easy on the wallet. It’s which is healthy that online has managed to get most likely to give searching of these galoshes more effortless.. To decide if a sneaker possesses curled past, change it upside down. pick black or brown tones. Made the cakes last night, they were great. great flavor, the real thing. Had some crab cakes at the restaurant recently, but was disappointed. they have too much filling. I cooked a few and froze the remaining, looking forward to the next meal with them. Instead of the Tarter Sauce, I made a cocktail sauce, which was really good too. thank you for posting this recipe. I like the tartar sauce. Great amount of mixer; however the crab cake is salty with both the Old Bay seasoning and salt together. I will say one or the other if both minimize the sparkle on the salt. I have read and reread this recipe, and do not understand why you need the foil lined baking sheet if they are fried in frying pan. Hi Patty, It’s just for easy clean-up. I should have made that clear; sorry about that! I’ve been making a very similar recipe for years. However, I refrigerate the crab cakes on a cookie sheet (Silpat mat works great here). Heat oven to 400 degrees, move crab cakes from refrigerator to preheated oven. Bake 15 minutes, then turn on broiler to brown nicely. Great taste, less fat and much less cleanup. Theses were great! I’ve made them several times minus the celery. They freeze well also. I prepare as directed and freeze them uncooked. They fry up perfect straight from the freezer! These were wonderful! Much lighter than other recipes I’ve tried. I made these crab cakes last night for my husbands birthday dinner. They were delicious and my husband loved them! Thank you for the recipe! Hi Jenn, I made these crab cakes for company the other night and WOW, were they delicious! Also made your Peel and Eat Shrimp and Cornbread Muffins…my guests couldn’t stop raving about the food. Thanks for making me look good! When Grovsenor Market , (in the bottom of the 1st Grovesenor high rise) , on Grovsenor Lane off of Tuckerman Lane, is having their sale on lump crab meat, you can’t beat the price anywhere. It’s great crab meat in a container in their meat/fish section. Good to know, Ronnie. Thank you! I was searching for a quick tartar sauce recipe on Pinterest & found yours- I just whipped it up at the last minute for dinner & it’s great! This was my first attempt and it’s a keeper- thanks so much! If we don’t have old bay seasoning, what would be a nice replacement? Panko is a type of breadcrumbs; if you can’t find it try crushed up saltine crackers. Panko Japanese Breadcrumbs can be found in the deli section here in Canada – they are lighter than regular B Crumbs and way tastier!- hope you find them! Best Crab Cakes ever! The Tartar sauce was amazing! Will be making these again soon! I grew up in Maryland and have kept the food traditions alive since leaving the state many years ago. Personally I like your recipe, but would forgo the celery and Old Bay, and add a 1/4 teaspoon of red pepper. I have never used panko, only 2 slices of finely chopped bread crumbs (white bread) per pound. Lastly, I would never put steak sauce on a quality steak and cringe at the thought of tarter sauce on a delicate and bound to be delicious crab cake. But go with what you like. Cheers! I made these for Christmas Eve – they were delicious. I omitted the celery – just a personal preference – everything else was followed to the recipe. Will be added to my recipes book as a staple. Thank you! What would you recommend as a fill in for “Old Bay”? I am a West Coaster (Canada) and am not familiar with this seasoning…. Hey! Everyone looking for old bay, I live in BC, Canada, and have found it at Save on Foods! saw it for years and never had a use for it until this tasty recipe! I have made this recipe and I absolutely love them and so does the family. I grew up on Long Island, N.Y. and they have great crab and lobster and I have also made this recipe with lobster meat. Amazing. These were amazing. I am definitely making them again! I am a true fan of crab cakes! I will try this recipe out but agree on not using celery. (Well, I guess i will try it once!) My experience in the past has been when forming the patties, if they do not hold together, place back in bowl and add a tad more mayo. Be careful because it does not take much to accomllish this. Put back in the refridge for 15 minutes. I think it is the size of the crab chunks determining this step! These were great. Tasted light and the seasoning was perfect. I even made the tarter sauce and they went well together. 5 stars. I’m sorry but this may sound stupid. I’m from Ga. What is the panko? Hi Tammy, Panko are Japanese-style breadcrumbs. They are flakier than regular breadcrumbs. You can find panko at most supermarkets but if not, you can use crushed up saltines. I’m a MD girl and if your a true Marylander we only eat saltine crackers and mustard with our CRAB CAKES. These recipes look good, as I have never had crab cakes, But I love crab legs and claws. How would it work if made with chopped shrimp or lobster? How would I be able to broil these? Hi Michelle, I’d brush them with some melted butter and broil about 6 inches from the broiler until they are slightly browned, bubbling and hot. This is what is for dinner tonight i love it. A few of suggestions for those having a challenge of the cake staying together. Instead of panko use fresh white bread. Cut off the crust and mix it in with all the ingredients except the crab. Use enough to make a paste. Then fold your crabmeat in. You can also use seafood mousse. (not a big fan of this) Also you can add more mayo and broil your cakes. Healthier and just as tasty as pan fried. BTW for the Crab Cake lovers out there, Try Valle’s Italian Steak House. They make some awesome Cakes!! I’m from Maryland originally.Now I live in Ohio.When ever I go back, I have to go crabbing so I can make these because I absolutely love crab cakes!Nothing better than fresh. My thoughts are less is more. 1 lb. of crab meat,1 egg, 1 tbs. parsley,1 teas. old bay seasoning,1 teas. yellow mustard ,1 teas. dry mustard,1 tbs.worcestershire sauce, 1 teas. lemon juice, 2 tbs. mayo ,6 Ritz crackers,crushed. Mix. Shape into cakes. They will be sloppy. Cook very slowly so the egg has time to set up and they brown. don’t hurry to flip them. When ever I make them they are a big hit! I made these at my aunt’s house last summer and we added some diced red peppers to the mix. It helped give the filler a little crunch. And I like the extra taste it brought to it. Not for everyone, especially if you’re sticking to DE traditional, but a nice little addition for those into trying new things. I’m also a Marylander and agree that the simpler the better…no to celery, onion and green pepper and prepared mustard. Mustard powder instead. Panko works good, and is easy to use, so I’m fine with that.. Otherwise white soft bread, crusts removed, or saltines crushed finely as the binder. These can also be baked at 350 for 20 mins. They won’t fall apart that way, but fried is the tastiest way to make Md crab cakes. I am from Maryland and these were delicious, old bay works on anything. This is a GREAT recipe! You can also substitute the bread crumbs for 6-8 saltine crackers (my in-laws are from Maryland and use them all the time in their crab cakes). With family from Maryland, it’s hard to compete with their crab cakes, but these definitely do! The cakes and the sauce have a great flavor!! Any suggestions as to what can be used for a binder in place of egg? Daughter’s boyfriend is highly allergic to yolks and whites but loves seafood. These sound awesome and would like to try them out. You could try using a bit more mayonnaise instead. Instead of egg, you can use egg replacer (found in allergy free section) or ground flax seed mixed with water. There is also egg free mayonnaise you can buy or make. It won’t taste exactly the same but with enough crabmeat, they should still taste great. Mayo. has egg in it. Hi Anna, I can’t think of anything else you could use. Maybe just broil them instead so they stay together? I might also brush them with melted butter afterwards to give a little richness. hors d’oeuvre party. Made a double batch last year and they where gone in 10 minutes. I would like to make these in bite-size portions to use as a hors d’ouvre. If I can only re-heat them in a toaster oven…how long should I heat them for? Hi Linda, If you make them small, they won’t take long…hard to say since I don’t know what temperature but I’d guess 10-15 minutes at the equivalent of 350. Thank you so much! I’m going to make them for Christmas Eve dinner. Cheers! Hi Christina, I suppose but I think they’d be better if you fry them a few hours ahead of time, then re-heat them in a 350-degree oven. Hope that helps! This looks amazing. Could you freeze them after chilled and coat and cook later? Hi Nadine, I wouldn’t freeze fresh crab meat…just wouldn’t be the same. Sorry! Just found this recipe on Pinterest. My husband can’t wait for me to go to the store tomorrow to buy ingredients to try! I just put my cakes in the fridge for their 1 hour soak…per comments i didn’t use celery nor panko…hoping they taste as good as they look.. Ate Crab cakes once in MD in 1997 and haven’t since (i’m from WA) so I hope I can recreate!! Hi Lexi, I hope your crab cakes came out. I suggest using the panko as called for in the recipe. It’s such a small amount that it doesn’t affect the taste, and it really helps bind the crabmeat together. NO celery. It just will not do. These look wonderful and for a second could almost smell them cooking! Loved it when my Mom made them. I am allergic to iodine. What can I use in place? I had a chicken cake in Kansas at Hennessays. Any help? what do you serve with crab cakes? I love crab cakes with corn on the cob and a green vegetable…cornbread or corn muffins are nice too. I love crab so I was excited to make these cakes. They tasted delicious, but didn’t stay together. I ended up with a hot, crabby mess in the pan that was pretty much just a seafood salad. Hi Alyssa, So sorry you had trouble getting the crab cakes to stay together. Did you let them sit for an hour in the refrigerator? This really allows them to set. Also, did you use lump or jumbo lump crabmeat? Jumbo lump is so large that it doesn’t hold together well. Now, I will preface this statement with I LOVE to cook & have tried several crab cake recipes over the years. Nonetheless, It’s 11:42pm and my husband and I just finished this DELICIOUS meal! I pretty much followed the recipe as stated. I was unable to find the suggested mustard so I used Dejon and instead of the refrigerator, I placed them in the freezer for about 30 minutes! OH! After reading the reviews, and at the last minute, I mixed some Old Bay with some flour and LIGHTLY dusted the cakes prior to placing them in the oil! VERY, VERY TASTY! This was a restaurant quality meal in the comfort of my home! THANKS FOR SHARING! This recipe sounds delicious! I will be adding it to our menu in a few weeks. Thank you for sharing! My husband grew up in Maryland, and his Mom wa born and raised in the Chesapeake Bay area..no to the celery. They use and prefer powder dry mustard, and unseasoned bread crumbs….store bought is fine…but everything else is the same as his Mom’s recipe. She served them with home made cole slaw. If using dry mustard powder instead of Dijon, how much should I use? Sandy, 1 tablespoon of regular mustard is the equivalent of about 1 tsp of dry mustard. Hope you enjoy the crab cakes! Can’t wait to make these – Maryland crab cakes are THE BEST! I no longer live on the East Coast (in Md.) and authentic crab cakes are something I really miss. I am a purest and believe you NEVER put celery in a crab cake, same with onion….all this does is hide the delicious flavor of the crab. With crab cakes the few ingredients the better. I would try this recipe but leave out the celery, reg bread crumbs instead of Panko, and no dijon mustard, again, that ingredient hides the flavor of the crab. We make these all the time. The trick to getting them to hold together is refrigerating them, so don’t be tempted to skip this step. Maybe this is blasphemy to Marylanders, but I use a Cajun remoulade for the sauce. So tasty! I have made two different sauces for these. A lemony hollandaise and a creamy dill sauce. Both went over well. Which you use is a matter of taste that day!! I use dijon or whole grain mustard too. Very excited to try these have just put them in the fridge to chill. Also was lazy and used Always Fresh tinned crab meat, Im sure its not as good as fresh meat. Also just a tip I found was to use a heaped 1/2 cup to scoop the mixture onto the baking tray made exactly 6 and it saves you from getting messy hands and you get a nice round crab cake. i used your idea of putting the crab mixture into the 1/2 Cup for measuring…worked to a tee! Put it in, lightly smashed it down, then hit the bottom of the measuring cup with my fist and they all came out perfect! Thanks for the tip! My hands didn’t get dirty once during this step! I made these for my mom and I toight. I was a little frustrated because they would not stay together when I was shaping them into the cakes, and then they began falling apart in the oil. This was annoying since I had followed teh recipe exactly. Hi Liz, Sorry you had trouble getting the crab cakes to hold together. Did you use jumbo lump crab meat? Sometimes if the lumps are too large, they can be hard to form into cakes. You don’t want to shred the meat, but smaller lumps work best. Hope that helps. Thanks for the tartar recipe as well, much better than from a jar, yum! Hi Marva, I don’t have a particular brand that I always buy…sometimes I get it at Whole Foods and other times I get it at the Maine Ave fish market downtown. Sounds wonderful! Going in my recipe file! I can’t wait to make these. The recipe sounds yummy!! I agree about no celery and fresh bread for authentic md crab cakes. the simpler the tastier it is. We don’t use parsley. Traditional to eat them with saltine crackers. My Maryland born husband and brother to a professional Annapolis seafood chef says.. NO to celery and use only fresh bread crumbs instead of panko. He also thinks good old yellow mustard is best, but doesn’t realize that my crab cakes, which he loves and thinks are better than his brother’s, include dijon like yours. shhhhhhh and I also add a small amount of finally diced sweet vidalia onion. I usually sauté my cakes in half butter/half oil. The butter adds some wonderful flavor, the oil tempers the butter so it doesn’t burn. Grew up on the Chesapeake and dad was a commercial crabber. Agree with everyone above that says NO on the celery, regular mustard is fine. We never added any bread filler at all but I guess a tiny bit wouldn’t hurt. We used plain old flour to coat the outside. Looks great. I was wondering if you could use salmon or would that be too soft? This WILL work great with salmon, I do it all the time, just drain off one can of the salmon juices and use the other in the recipe. This will make it stick together better, and coat it with with either flour or seafood coating before frying, also helps to prevent falling apart. The flavor and taste are awesome. Simone: My grandmother taught me to make salmon cakes using mashed potatoes and following the same crabcake recipe. Dip the salmon cakes in flour before frying in your favorite cooking oil. These are awesome, I made these while living in Maryland and they taste like restaurant quality crabcakes. Great recipe! Best crab cakes ever! Thank you! I’m from Smith Island Md. in the middle of the Chesapeake Bay. The crabcakes look head on, except for the celery, but I’m sure they are just delicious with the celery addition! These look delicious! Are there any alternates to using mayo for someone who doesn’t like sour cream or ranch or any of the other usual suggestions? so glad you use panko bread crumbs, they make the texture of the crab cakes so much lighter. and I so appreciate a crab cake that is mostly crab. Love this that we can control how much salt or anything that is detrimental to our health…Cant go to Maryland so their crabs are brought to me.. Yes.. They look delish, here in Maryland don’t know of many people who add celery though…Now I want one. I am making these tonight!!!! I am gonna get a shower & go to Neighborhood Wal-Mart & get what I need!!! Can’t wait for dinner!!!! I’m making these tonight for birthday dinner — cant wait to try them! Looks yummy…I’ll have to make it this weekend. I made these for dinner tonight. They were a hit! My 6 yo son ate THREE of them 🙂 Will definitely make them again! My entire family (even all 5 kids!!!) really enjoyed these! Thank you so much for sharing the recipes! They look delicious. Thank you for including the recipe. What a shocking dinner selecion for my Husband. From the eastern shore & this recipe is perfect! Jack is right about the celery. Also, Marylanders do not eat tartar sauce with their crab cakes. Otherwise, this recipe looks pretty authentic. I only add a little binder, just enough to fill the palm of my hand. When mixing, toss gently so as not to break up the lumps of crab meat. The trick is to form the patties, then place in the fridge for a little bit. They will solidify and hold together better while cooking, enabling you to use the bare minimum of filler. look delish! can’t wait to try making these and glad there is so little breading. My recipe is very similar but instead of celery I use about 1/4 cup minced green onion. Also I have tried it with half crab and half shrimp chopped up. Even some of the better fake crab works if one can’t get the real thing. I’m from the N.W. and we use dungeness crab. My comment got scrambled up! This is what I wanted to say: I’m from So. Maryland, St. Mary’s County! Crab country and this recipe is the BOMB! We catch our crabs off our pier on the Wicomico River. Can’t wait to try it with our fresh crabmeat. I’m from So. Maryland, St. Mary’s County! Crab country. Catch our crabs off our BOMB! Mmmmmm! Can’t wait to try it with our crabmeat. I wonder how this would taste with “Comeback Sauce”? Yum! I think it’d be good, Stacey! Could you bake these to save on calories from the oil? If so, do you recommend a temp and time? Hi Cindy, I like to pan fry crab cakes for additional flavor, but you can bake them in a 350 degree oven on a lightly greased baking sheet for about twenty minutes, or until hot. I’d slide them under the broiler at the last minute to get them golden brown on top. Hope that helps! This recipe is awesome! Better than just about any I’ve had at restaurants and as good as the Maryland Crab Cakes I ate years ago at the restaurant located in the Watergate hotel in D.C. – and those crab cakes were GOOD!!! Thanks!! This looks like a real Maryland recipe, except for the celery, no Marylander would ever put celery in a crab cake. I would also suggest making only four cakes, these are so good you will want a larger crab cake. Delicious! This is my new favorite crab cake recipe, for sure. I just made these for Father’s Day Dinner & they were GREAT! My husband immediately loved them as soon as they hit his taste buds. He’s from DE and loves fresh seafood. These were right up his alley. I paired this with roasted organic red potatoes, corn on the cob & your corn bread recipe. Thanks so much for the recipe…P.S. I’ve been sharing all the recipes on facebook & telling everyone about this wonderful site. Looking forward to making more recipes. I made these the other night and they were delicious! Note for the other gluten-free poster — I could not find GF panko either, so I used regular GF breadcrumbs (Glutino brand). The crabcakes were still fantastic! The tartar sauce is delicious also. However, the quantity of tartar sauce suggested by the recipe is a bit too much — I will halve it next time. I made these last night and the were WONDERFUL! I live in Houston and I couldn’t find Old Bay, but used Emeril’s Essence successfully instead. I too live in Houston and always find old bay at Heb and walmarts. I made these exactly as is and they were wonderful. My husband is already asking me to make them again! This looks fantastic – I’m trying it out this weekend! May I ask – what do you normally serve for side dishes with crab cakes? Thanks for all of the fabulous recipes! I think even in my dreams I will eat this dish looks really delicious. I am printing this out as I type so I can make this for dinner. They look beautiful! Love crabcakes! Your recipe is very similar to what I do – and you are right – the secret is easy on the filler.